THE SKINNY: Tinted lip balm is a wonderful thing in my book. That's why I liked Cover Girl's Jumbo Gloss Balm. 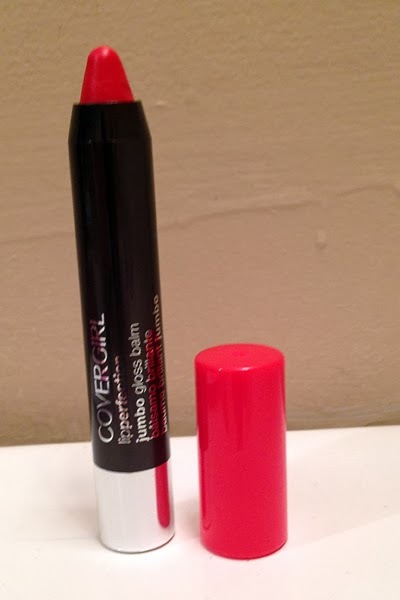 Cover Girl describes the effect as "sheer color," so I went with Ruby Twist, the brightest of the reds. The color looks horribly bright in the pencil but is very muted when it goes on. Jumbo Gloss Balm is made with shea and mango butters. The color lasted about an hour, and the moisturizing effects about two hours. Be warned, though. There's nothing glossy about this product. The finish is much more matte than anything else. But I like the moisturizing benefits of this lip product, so it gets a good mark from me. KEEP OR TOSS: Keep. This will be even better as a weather turns cooler. CHECK IT OUT: Jumbo Gloss Balm comes in 16 colors.